The Fresh Music Page: Singer Tyrese Compares Fat People to Crackheads! Singer Tyrese Compares Fat People to Crackheads! Give a celebrity a twitter and watch them make a fool of themselves. Tyrese is the latest celebrity to confuse his celebrity and twitter following count with the idea that he’s some type of self-help expert. 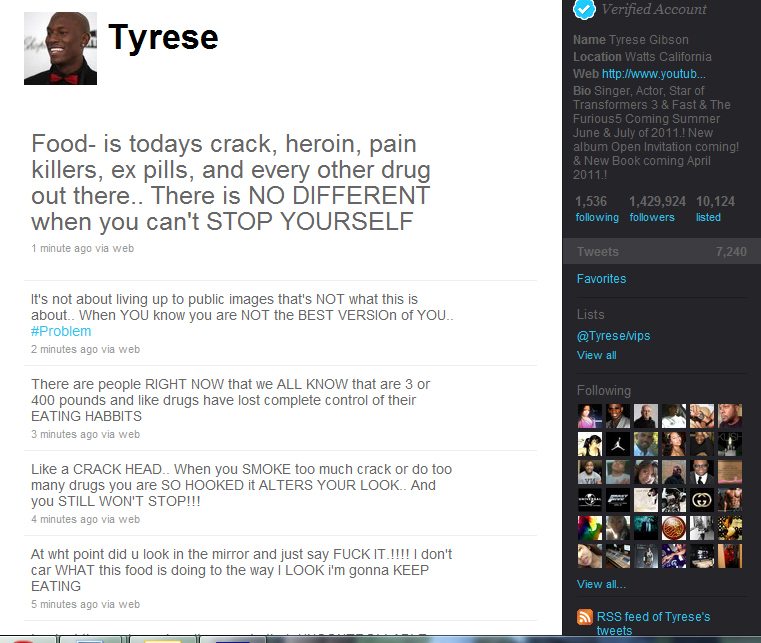 In a late night rant singer/actor Tyrese Gibson rants about food addiction and compares it to people addicted to crack. So Fresh People what do you think of Tyrese rant? See, I always thought that today’s crack was actually crack. No doubt obesity is a problem in our society but comparing someone who is overweight to a crackhead? I’m going to have to object to that situation but then again look who said it. It’s not worth arguing with an idiot. I think this is another case of a celebrity that needs to stay in their lane. 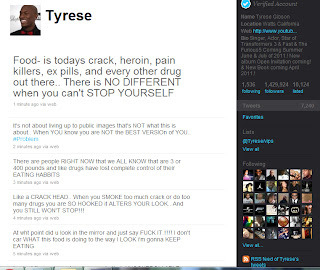 Tyrese needs to learn how to spell before he tries to preach and tell others what to do. I followed him for one day a few years ago and unfollowed with the quickness because of his overly preachy and condescending tone. When I see his RT's complete with his misspellings, I cringe. His spelling is as bad as his recording career but not as horrible as his acting. I don't follow him and a friend pointed me in the direction of his foolish tweets. I'm actually surprise other blogs didn't pick up on this. However, it seems like this isn't his first time saying foolish things for attention. Why do you have to take it there! He is comparing food to a drug, to an addiction, then you have to go and say he's talking about the people! I understand exactly what he is saying! I've had issues with my weight for years, i'm not overweight but wish i was slimmer. I got to the point where i would purposely throw up because i felt so bad after eating. I'd say to myself, i'm not going to eat some particular food (whatever it may have been) and the urge i felt was terrible and i always ending up eating it, feeling fat then either sulking or forcing myself to throw up (let me tell you i used to read articles about bulimia thinking why the hell would someone do that and its strange to think i did it). I got addicted to fast food where i would have it nearly everyday, even though i said to myself i'm not going to go out and buy it over and over again. It was like someone was literally pushing me out the door to go get it so i could stuff myself!